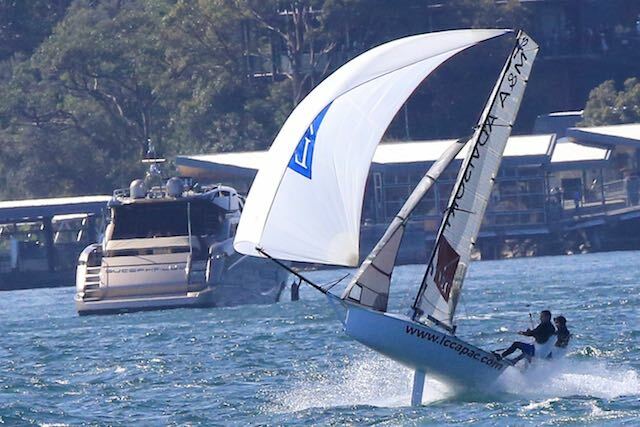 Nick Press and Andrew “Noddy” Hay in Sydney Sailmakers are the NSW State Champions after a commanding performance, winning 4 of the 6 races. Race 4 was the long course race on the Saturday. The weather was stormy, with the odd fresh gust followed by periods of not a lot of breeze. Many made their decision off the back of the 20-25 knot Nor-Easter that was showing on the Harbour and put on 3rd rigs, whilst some put on 2nd rigs given the lack of action on the water in front of them. It was the 4th race in a row that the fleet was split on rig choice. The 5 minute gun signalled the start of the breeze though and it got fresh! The breeze went Nor-West but the Nor-East course saw the fleet reaching to the top mark, and it was the Press boys Nick (Sydney Sailmakers) and Murray (Form Civil) leading the way. Bullets making their way over the hill at Greenwich saw both capsize though, with Geotherm taking the lead until a similar fate hit them on a reach to Specticle Island mark. LCC Asia Pacific (Jonathon Temple & Richard Jones) had a turn in the lead, with Sydney Sailmakers back up and chasing hard when a rain squall took the breeze close to 40 knots. It is fair to say that at this stage, most of the boats had a little rest on their sides, it is worth remembering that there were a few 2nd rigs on. The squall passed, dropping the breeze back to a manageable 15-20 knots… and then 10 – 15 knots…. and then 5-10… and then 0 – 5 knots. Sydney Sailmakers took the lead after a battle with LCC Asia Pacific and Geotherm had a battle with Form Civil for 3rd. The lack of breeze managed to squeeze most of the fleet together as the race became a marathon. Sydney Sailmakers took the win in around 2 hours, but many of the fleet, with a bit further to go when the breeze fell out, took 2 hours 45 to finish. At least rigs looked a bit easier to pick on the Sunday, with almost everyone putting big rigs in, although there was some threat of more breeze coming. A fairly sad looking Westerly greeted the fleet for the first of the short course races. 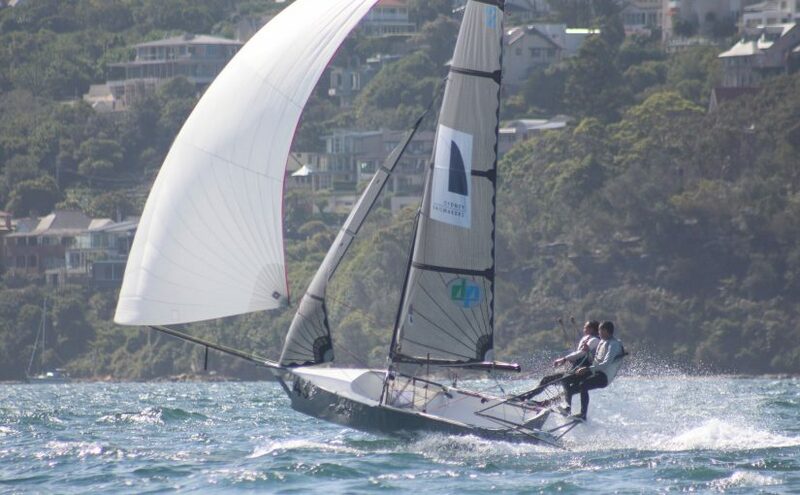 A couple of local, bearded trouble makers made the best of the start, with Peter Polec on Skoll and Jack Winning in Chapman High Performance Sails making the best of the start. Unfortunately a looming Easterly wandering it’s way down the harbour took the Westerly away and many positions were swapped as little bits of breeze came from the West or the South. The Easterly finally came through, which made the Westerly course a little uninteresting. Sydney Sailmakers had managed to take the lead by the top mark, still working as the back half of the fleet closed in with spinnakers up. Geotherm managed to take the lead and a shortening of the course (the first work had taken a long time) saw them work back to Manns Point to take the win. Sydney Sailmakers were second, guaranteeing that they would win the States. Race 6, the second short course of the day, was a bit more sensible. The course was moved to an Easterly, and it reached top-end of big rig from time to time. Sydney Sailmakers and Terms & Conditions made the best of the start but the tight reach from Valencia Street passed Clarkes Point were the undoing of both the leaders, who capsized. Terms and Conditions, with Lachie Paramour on the helm, managed a nose dive as a bullet combined with some badly placed moorings to send the nose down. Geotherm managed to take the lead and hold on for the win. A tremendous performance from The Bird (Jamie McCrudden) saw them place second and ask the obvious question of why they waited until the last race to put in that type of performance. Form Civil held off Sydney Sailmakers to take 3rd. This entry was posted in News, Race Reports on December 4, 2017 by Skiff-Ed.